In addition to creating your own lists, you can import and export lists created by others as well. These commands are available from the 'File' menu. Finding Lists: You can find additional lists on the download page. 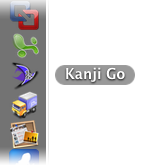 Further, all users are encouraged to share their lists via the Publish tool (Kanji Go> Tool menu> Publish), or by sending me a copy in so I can post it on the vocab list downloads page. Printing Lists: You can print lists as they appear in your search results or the Study Tab's View List screen, by selecting 'Print...' from the File Menu. If you've got no search results, or the currently selected vocab list is empty, this option will be grayed out. Importing Lists: From the 'File' menu, select Import List (cmd o). In the dialogue that appears, select any vocab list file, and click 'Open'. 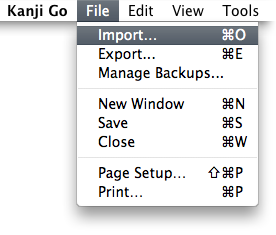 If Kanji Go can read the file, it will import any and all vocab lists from that file. 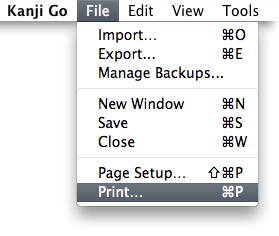 Note: If reading in a custom file, make sure to select the correct format from the drop down menu on the import screen. Exporting Lists:From the 'File' menu, select Export List (cmd e). In the dialogue that appears, type in the name for your vocab list file, and choose which lists to include (All Lists, or one specifically) using the 'Export List' drop down menu. Click export, and a copy of the list(s) will be saved. 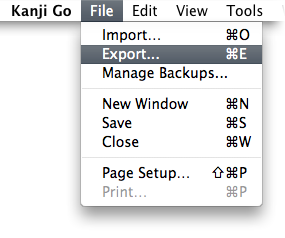 The exported file is saved using EUC-JP encoding, and is readable by all versions of Kanji Go. 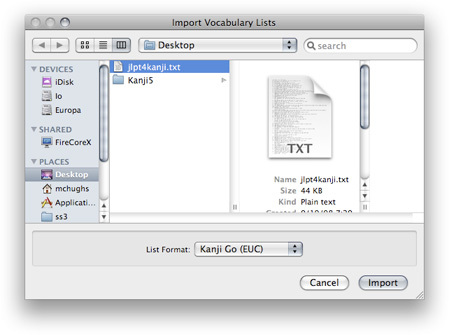 Creating an Import-able List by Hand: If you already have a vocab list that you've created outside Kanji Go, you can format it using any spreadsheet application (such as Microsoft Excel), and Import it. First Row: Name of your list. The first column must contain: while the second column should contain the desired list name. 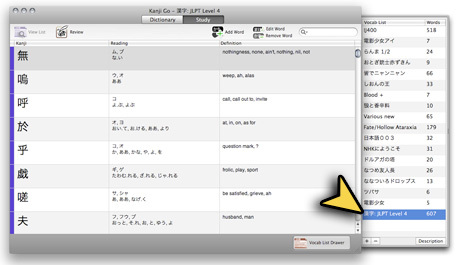 Entry Rows: One column each for Kanji(optional), Kana, part-of-speech (optional), definition. In the example above, no part of speech is given (instead I filled in "-"), and two of the words do not have a kanji equivalent (so the kanji field was left blank). Saving the List: From Excel, select File> Save As... In the dialogue that appears, select UTF-16 from the 'Format' drop down. 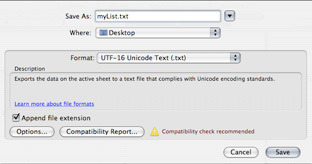 To Import, follow the steps above in #2, making sure to select 'Custom: UTF-16' from the 'List format' drop down.